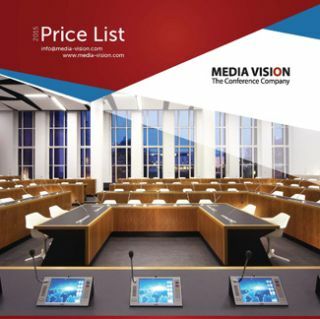 An updated Media Vision price list is now available to authorized dealers, including the full range of TAIDEN conference and interpretation systems. Noteworthy additions in this new list include main units equipped with Dante interface, as well as many new design and functionality options for multimedia terminals and wired, flush-mount microphones. A flush unit with retractable microphone array, model HCS-4851, provides integrators with a low-profile microphone solution that disappears when the room is not in use. Prices for the HCS-8300 multimedia conference system have dropped and new models offer more flexibility to select only the functions that are truly needed for a project. The 8335 Series Video Microphone unit — a conference microphone system with built-in 10-inch video monitor — now comes with microphone array and E Ink nameplate options. This is also the first price list including the new TAIDEN HCS-3900 Series Entry-Level Digital Conference System, a solution for mainly portable applications, with audio recording capability directly from the central unit via USB port.